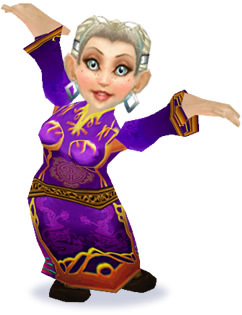 Today, Breanni is probably most well known as the Pet Supplies NPC vendor in Dalaran. This was Blizzard's in-game tribute to honor the creation of this site. Breanni was originally one of my own characters that became the virtual host of WarcraftPets. In the real world, I'm a web designer, graphic artist, writer and entrepreneur. My specialty is smart web design. These days, I no longer have much time to play World of Warcraft. But a few years back, I played quite a bit. In fact, with so much game time under my belt, I managed to play one of every class/race to level 82+. And as you've no doubt gathered, I've always been an avid collector of companion pets. Why did you create WarcraftPets? Early on when I began playing WoW, I hunted for a vanity pet guide without any luck. That prompted me to do a little research and create my own. I figured since I was already preparing a guide, I ought to share it with the Warcraft community to help others. So I posted it on the official Warcraft forums and my popular "Guide to Vanity Pets" was born. Since pet collector's were so pleased with the guide, I decided to take it to the next level and create the definitive website for companion collectors. Have you received any honors or awards? As noted above, my greatest honor came in the form of a Breanni NPC [news] selling <Pet Supplies> at the Dalaran pet shop. 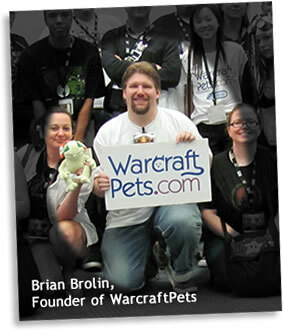 Additionally, I was featured in a 2-page spread of the first issue of World of Warcraft's official magazine. I've also been interviewed by WoW Insider, the leading Warcraft blog site. Check out the interview for my take on certain vanity pets and other interesting tidbits. Lastly, an NPC Siamese cat was added to a room in Stormwind's inn. 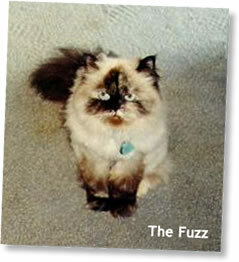 It's name is Fuzz. Several people suggested it might have been named for my own real-life cat who passed in early 2015 (pictured). Fuzz was later moved to Breanni's pet store in Dalaran, confirming that it was indeed Blizzard's first nod to my work on WarcraftPets. How long did it take to create WarcraftPets? It took nearly three months of programming and design work to complete. The site was coded entirely from scratch. When it launched in April 2007, it was essentially just a database site. There was no community and no way for people to track their collections. Those things came several months later. The WarcraftPets team and I continue to develop and expand the site with any eye on expanding the site's data and capabilities. Feel free to support us if you'd like to show your appreciation. Why the fascination with vanity pets? As soon as I discovered companion pets in WoW, I always wanted to collect the little guys. I thought to myself, "How cool would it be to have a cat or a dragon following my character everywhere I go?" What was your first companion? Getting my first pet was a challenge, even though it was quite common. I took a young, level 12 Breanni in search of Donni Anthania. I only knew that she was somewhere in Elwynn Forest (and I actually thought it was a "he"). I searched in utter frustration for over an hour. Having access to this site back then would've saved me a lot of trouble! When I finally found her, I blew almost all the coin I had on my very first pet: a Silver Tabby. That's a tough one. I'd say my most prized pet is probably Murky due to his rarity. Do you have any pets in real life? Absolutely! My wife and I have three little bundles of fur. We adopted Kirby, our Rat Terrier, from my mother who passed in 2008. In 2009, we adopted another cat, Mirabelle. Her nickname is "Moo-Moo" because she's on the large side. Our newest furry kid is Quigley. He's one of the most affectionate cats I've ever known, but he's also a wicked troublemaker and he makes it impossible for us to keep toilet paper on rolls. I love WarcraftPets! Do you do accept donations? Meg, my wife - Thank you for supporting me throughout my progress and success with this site. You truly are one of a kind. I you, forever and always. Weena, Quintessence, and Doobjanka - You guys do an INCREDIBLE job! I can't thank you enough for everything you do to keep this site and its community running smoothly. Bees, Wain, and Drrum - Each of you does something critical to keep the site online (Bees), up-to-date (Wain) and entertaining (Drrum). Thank you all. Andrew Nebus - Over the years, you've been a great friend and mentor. Thanks for all of your insightful guidance. Site MVPs - A great big thanks to all of WarcraftPets' MVPs, who have gone above and beyond to help support the site in many different ways. You guys rock! Blizzard Entertainment - A final thanks to all you talented people working at Blizzard. I've been playing your awe-inspiring games for over more than 15 years. Thanks for creating a virtual home away from home within the World of Warcraft.